1. If you have not paid your NOCRA membership dues your ability to Self Assign will be limited. 2. Arbiter limits self assign to the first 50 games, sorted by date, time and game number. So you will see the 8 AM games first. If you do not see the games or times you want, filter the search by date and field. 4. The games will be linked in sets of two, three or four whenever possible. It doesn’t matter if you sign up for a Center, SR Assist. or Assistant, Arbiter will just place your name in the game set. Usually by Thursday night we will assign the Referees (Centers) based on ratings, observations and advancement. 5. There are limits to the amount of sets that you can self assign each day, Arbiter will inform you when you have reached the limit. The next morning you will be able to self assign again. 6. 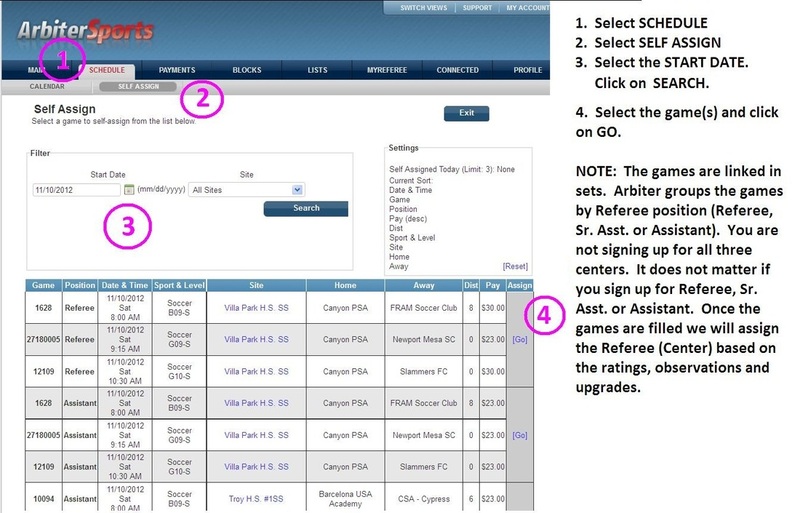 If you would like higher level games request an observation – complete the form on the NOCRA website. 7. We reserve the right to remove or change referees on games for the good of NOCRA and those we serve. 8. Limit one set or 4 games max on a site per day.